Cartoons, like comicbooks, are often stigmatized as being "for kids," suggesting that they're just disposable, forgettable bits of pop cultural fluff with no real value to anyone of discriminating tastes. A lot of times, that's true. Camp Lazlo isn't exactly aiming for the high-brow crowd, you know? But every so often, a cartoon will come along that may not tear up the ratings charts, but absolutely hooks anyone who watches it, kid or adult. Something that pushes the boundaries of what a cartoon can be. Gargoyles did it back in the '90s, and right now audiences are being engaged by Avatar: The Last Airbender. Part of the appeal is the show's massive supporting cast. Even characters who only show up for an episode or two have a complete backstory and fully fleshed-out motivations, which may come back and be important again later. Take, for instance, the young vigilante Jet, who is part Robin Hood, part Peter Pan and all dangerous. Jet's parents were killed by soldiers from the Fire Nation, so now he lives in the woods and fights the soldiers guerrilla style. Jet is really one of the first figures to come from outside the nucleus of the show's ensemble cast, so of course he's hard to find. If this was a line of X-Men toys, he'd be Iceman: popular, but overlooked because he's not Wolverine. It doesn't help that Mattel is behind these figures: remember, these are the same people who killed He-Man and Batman, and can't get a DCSH villain figure out to stores within the first five months of release. The figure's sculpt is good. Jet's outfit is sort of a feudal rustic armor, and it's been duplicated well. The notion that he's just been living rough out in the wilderness is uderscored by the fact that his gear (his armor, at least) is asymmetrical - he's wearing stuff he found or managed to steal off a defeated foe, not a specially designed suit of armor. The shoulder pads are of two different styles, as are the layered kusazuri on his hips. He's wearing plain shoes, then has wraps around his lower legs, which makes his pants start to puff out at the knees. Avatar is an American show, but is so heavily influenced by anime that it blurs the line between the two. One of the show's myriad influences is Shinichiro Watanabe's Cowboy Bebop, which may explain why Jet bears such a resemblence to a young Spike Spiegel. He's got the angular face, the puffy hairdo, and even the self-confident smirk. One new feature, though? His huge jug ears. They're not that huge in the show. For some reason, the paint on this figure is really glossy - everything seems to shine. Normally we'd chalk that up to the parts just being molded in the color rather than painted, but this is obviously paint. 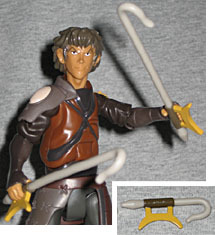 All the Avatar figures have this problem - it's endemic of the entire line. Other than that, things are fine. Avatar uses a uniquely muted color palette, and Jet is all decked out in earth tones - which makes sense, since his family was part of the Earth Kingdom. It's all browns and greys, with a spot of color for the shoulder pads. Jet isn't a Bender, so his fighting style is much more down to earth (no pun intended). He comes with his signature weapons, the hooked swords, as well as a pair of shorter hooked daggers. Yes, these are based on real weapons, and while the toy versions look like round tubes, they're actually supposed to be flat blades. The weapons can be held in either hand, and Jet is articulated enough to wield them fairly well: he has swivel joints at the neck and waist, hinges at the torso, knees and ankles, and balljoints at the shoulder, elbow and hip. Sure, they could have added more, especially since we're talking about martial arts characters, here, but this will do. Jet stands just over 6" tall. The Avatar figures are pretty good - they're definitely worth the retail price, though waiting for even a slight sale would bump that up nicely. However, there is one major, major problem with the entire line that Mattel hasn't even taken the smallest steps to correct: there are no girls. We've got Jet, but where's our Katara to put him in his place? Where's Snellerbee, one of his Freedom Fighters? Where's anyone? Get with the program, Mattel - Avatar is the future, and you're living in the past.